Location: In a walled churchyard on the E bank of the River Ithon, and the S side of a minor road between Howey and Newbridge-on-Wye, approximately 1.7km WSW of Howey. A medieval church, of which the S doorway is the earliest surviving feature. Windows in the nave and chancel are late C16 and C18. The tower is probably C18 (although a date of c1400 has been suggested), and the porch was added in the late C19. There was no internal restoration in the C19, leaving the detail and layout to reflect the pattern of worship followed in the C18. A Gothic style parish church comprising nave and chancel under a single roof, S porch and narrower W tower, of rubble stone, whitewashed to nave and chancel, and slate roof. The S porch has a front of coursed rock-faced stone, pointed arch and cusped barge boards. The side walls are whitened rubble stone with narrow windows and the roof has lozenge-pattern slates. Inside the porch are benches with backs of re-used wood panelling. The simple pointed nave doorway, probably C14 or C15, has double doors with arched ribs and strap hinges. Windows are mainly 2-light wooden framed windows with diamond-pattern leaded glazing. The nave has windows to the R and L of the porch. The chancel has a C16 3-light square-headed S window with cusped lights, sunk spandrels and hood mould. The C18 4-light E window is in oak, and is square-headed with cusped lights. The N wall has been partly rebuilt, probably in the C18 to judge from the date of internal wall paintings. The chancel has one and the nave has two 2-light windows. The 3-stage tower is battered at the base with a thick string course. Windows are late C19, although they are said to replicate the previous windows. A 2-light Decorated W window has a hood mould. On the N side is a blocked doorway to the NE turret. The middle stage has 2-light square-headed windows in the N, W and S walls, with cusped lights, sunk spandrels and wooden louvres. In the E wall are voussoirs above the level of the nave roof, possibly the relieving arch of a window looking into the nave. The upper stage has 2-light Decorated bell openings, each with a hood mould and louvres. A thick band is below the coped, embattled parapet. The nave has a 5-bay arched-brace roof with tie beams, 2 tiers of cusped windbracing, and panelling above the wall plate. The second truss from the W end is a later scissor-based truss with cusping above the intersections. The truss at the W end is C19, of sawn timber with raking struts, and the awkward half bay between nave and tower has panelling above the wall plate of a different character to the remainder of the nave. The simple tower arch is pointed with voussoirs, and is medieval in character, which suggests the existence of an earlier tower. The arch was formerly concealed behind a W gallery, which was still standing in 1870. Crude angle buttresses against the E wall of the tower might also have been associated with an earlier tower or bellcote, although they have also been interpreted as the cut-down remnants of the earlier nave W wall. The half bay at the W end of the nave has a cobbled floor, whereas the remainder of the interior has a stone flagged floor. There is no structural division between nave and chancel but wall posts below the E truss of the nave roof formed part of the former rood screen. The chancel has a ceiled 3-bay arched-brace roof. 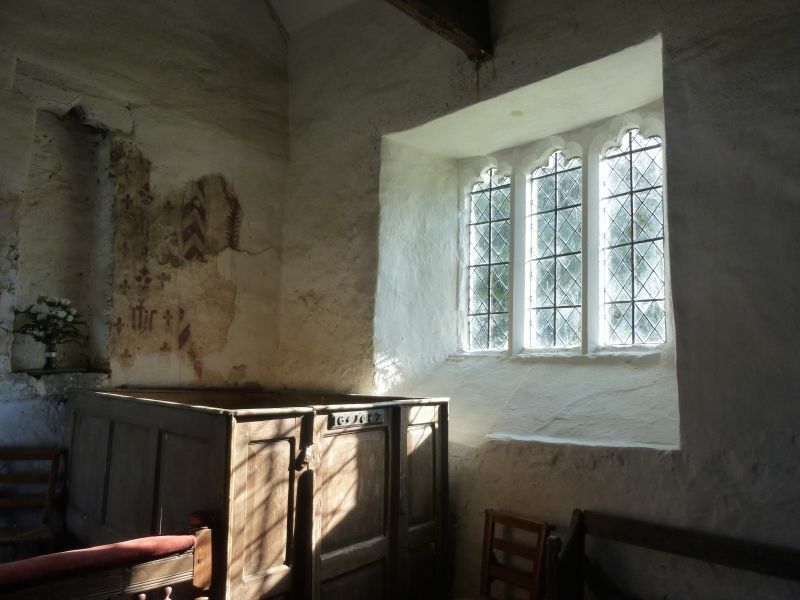 In the chancel is a segmental recess behind the altar with moulded wooden lintel (similar to Rhulen church, Radnorshire), and a recess to its R has a cusped wooden head. In the nave N wall is part of a plaster frame of a former painted inscription panel, which survives only partially and in a much-faded form. Further R is a faded Queen Anne Royal Arms. The nave S wall also retains part of a plaster frame. In the chancel E wall is earlier stencilled fleur-de-lis, IHS monograms, a banner with chevrons and a fragment of a plant, probably a lily. The octagonal font is probably medieval but was re-tooled in the C19. It stands on a squat round stem and base. Other internal furnishings constitute a complete and remarkably preserved Georgian parish church interior. It demonstrates the emphasis on the pulpit rather than the altar and is one of the small minority of such interiors to have survived the Anglican revival of the C19 and its renewed emphasis on the liturgy. The focal point is the panelled polygonal pulpit in the S wall, which is inscribed 'IG' in its door. On its W side is a later reading desk, which has a door inscribed 'EE 1706', and a panelled front with round-headed patterned arches in low relief. Nave and chancel retain a complete set of box pews of different dates, which include family pews with the names of their occupants (including James Watt, the inventor, who retired to Radnorshire in 1805) and unmarked pews at the W end. All pews, including those in the chancel and on the E side of the pulpit, face the pulpit rather than the altar. Box pews are panelled, some with raised fields, and some dated. On the N side these include pews with the inscriptions 'T Williams Penrhew 1808', 'LCI 1708', and 'LP 1710'. On the S side, beginning at the E end, 'ELL [1702? ]', a pew with 'In the Year of Our Lord God 1666' in raised letters over lozenge panels, and 'EP 1714 IW'. In the chancel are box pews on the N and S sides of the sanctuary. The pew on the S side has 'IG 1687' in raised letters, and may be contemporary with the pulpit, which bears the same monogram. Between the chancel pews is a partly renewed communion rail of turned balusters and reed-moulded rail, possibly late C17. In the chancel N wall is a tablet to Ezekiel Williams (d 1752), comprising an oval inscription panel against a rectangular background with low-relief foliage in the angles. In the chancel E wall is a memorial to Elizabeth Davies (d 1822) and John Davies (d 1796) by T Price of Builth. It has double inscription panels, apron and segmental pediment with roundel. In the chancel S wall is a freestone classical memorial to Margaret Lloyd (d 1826), also by T Price of Builth. An inscription panel is flanked by pilasters, above an apron with heraldic shield, and surmounted by a marble pediment with urn in high relief. Listed grade I for its exceptional architectural interest as a parish church retaining very rare pre C19 character, including a complete C17 and C18 interior plan and detail. Approximately 0.9km S of Howey village and immediately S of Llwynbrain Villas. In its own grounds approximately 250m NW of Howey village, on the W side of the A483. Spanning the River Ithon approximately 1km S of Newbridge-on-Wye.